Dr. Carol Folt has been chosen to lead USC, becoming the first female president in the university's history. When she starts at the end of June, she'll have her hands full as the university continues to deal with the fallout from a series of scandals. Most recently, several current and former athletic officials and coaches were indicted this month in a nationwide admissions scheme, accused of taking bribes to admit the children of wealthy parents under false athletic pretenses. 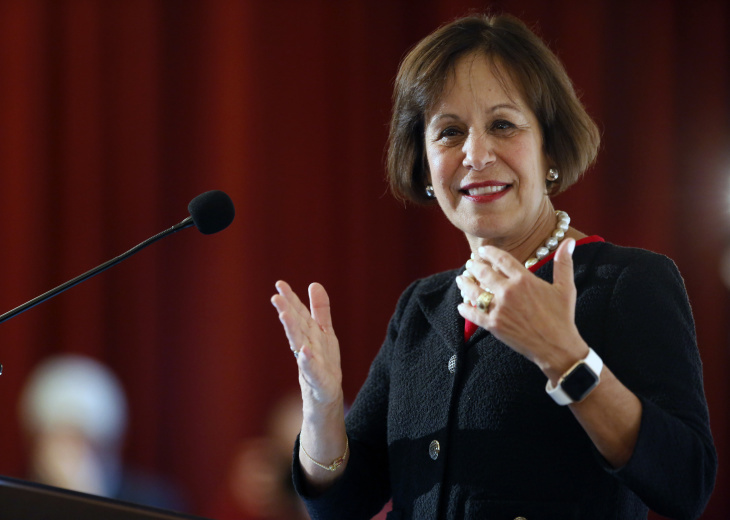 Folt previously served as the chancellor of the University of North Carolina, Chapel Hill from 2013 to 2019. She spoke with AirTalk Thursday about her upcoming job and how she plans to lead the troubled campus. The conversation has been edited for clarity. WHY DID YOU DECIDE TO BECOME A UNIVERSITY ADMINISTRATOR? I was a professor, and someone said "would you come help us in the interdisciplinary programs and graduate programs?" I thought that'd be really important, and I started doing it and found that I really loved being able to help other people accomplish things. I probably won't have students or post-docs anymore, but I'll certainly keep abreast of the research and may continue papers and things on that. But, in the beginning, I don't think I'm going to have a moment for that. There's a few things going on. WHAT ARE YOU GOING TO DO FIRST WHEN YOU START THIS SUMMER? It's really important that we remember that every college president has to handle tough issues, because all universities have them — and we certainly have them here. What's so critical is that we do those right, but we never lose sight of our day-to-day work — educating, teaching, doing research, saving people's lives — and that's why I'm here. It's the dual nature of this job, which is both the opportunity and the responsibility. When I come here, I'm going to do what a scientist does. I'm gathering facts so I can make informed decisions, and we'll make the decisions when we have the right information. We'll do them thoughtfully, with honesty and candor. To do that really well, you got to start by listening. We have to get all those things going at once, so it'll be a busy start, but I think I'll learn a lot. HOW WILL YOU INSTILL A DEGREE OF SUPERVISION, OVERSIGHT AND RESPONSIVENESS AT THE UNIVERSITY? I don't know everything in place. This is why you have to really have to listen and understand the entire structure of the university. I think in the immediate situation, [interim president Wanda] Austin and [USC board chair Rick] Caruso have been doing a great job acting pretty quickly. I don't believe in slow starts, so I need to get going with people very fast. One of the responsibilities I think a university has is to have the right oversight in, because it's up to us to make sure that people can do their work and be respected and do things responsibly. Although I don't know exactly what we're going to do yet, we're going to get it right and we'll emerge much stronger — and it will take work. I do know that when you can involve faculty and staff in the reforms that you make, they're going to be so much more successful, so that's also another way that I'll get started. HOW WILL YOU BOOST DAMAGED MORALE? I know that when I'm having a bad day, all I have to to do is go out and talk to the students. So one of the first things I'm going to do is go places that they are... be there, celebrate their amazing accomplishments. (Undergraduates) can't wait to feel excited and feel proud of what they're doing. We need to be demonstrating to them that we believe in them, and we're pleased (they're) here, and we want to see their success. In the same way, faculty have lots of things they're doing. Part of the point of being here is being a part of all the activities they do. I think that starts lifting spirits when you're able to celebrate what is going on. The next way you lift spirits though is to get them involved in solving the problem. I have been here for only a day and a half, and this institution is ready. Everybody I see says, "please call on me, let me help, I want to be part of the solution." People are expressing a willingness to help, so I have to take advantage of that. HOW WILL YOU WORK WITH USC'S BOARD OF TRUSTEES? I'm confident that I'll have their support when I need to make difficult decisions. I have to look forward, and I'm feeling like [the board] is going to be an asset for me. They have to be people who believe in the discovery and creative practice that takes place at universities. We're also — especially here at USC — deeply embedded in the community. (That) makes me think of USC as really a private university with a public heart. I think all (university) boards, no matter how they're convened, have that shared common direction. I start working on mission. How do I work with the board to make sure the mission is the thing that we're really concentrating on? HOW WILL YOU TAKE ON THE SCHOOL'S CULTURE OF SECRECY? I'm certainly hearing (about) that... I'm very experienced. I think I have a really good picture of what's going on here, which doesn't mean I can't learn — and I certainly will be out here doing that. My first meeting yesterday (was with) the academic senate, and it was great, and they talked about that: "We have to be involved. We have to do the things that really make us be understanding that we're working with honesty and candor." So as I come to this campus and work with people, I'm going to be exploring that. I do believe we're all a part of this, and we need to do this in a way that we really have people at all levels feeling like they know what's going on and that they're a part of it.